Pack your bags and get ready for fun at Adventure Awaits! Experience all the Northwoods has to offer at this unique home in Northern Wisconsin. Nested in the pines, this octagon log home is situated lake front on Spider Lake with your own private dock on the Manitowish Waters Chain of Lakes. Fill your summer days fishing, swimming and exploring the shoreline then come back in the winter for easy access to the snowmobile trails, ice fishing and more! Don't miss the incredible fall colors as the leaves begin to change and of course to drop in for a tasty meal at one of the many local restaurants, sure to keep you coming back for more. This 4 bedroom, 2 bathroom home features everything you need including plenty of space for 10 people, a fully equipped kitchen, WiFi, satellite tv services, washer and dryer, and so much more! You will find amazing panoramic views through out the house and a bonus walk out from the lower level. Looking for a place to park your sleds in the winter? Adventure Awaits not only has plenty of parking for your vehicles and trailers, but you have access to the garage as well! 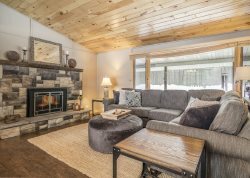 Come STAY and PLAY in the Northwoods all year long at this fun and exciting new home! Pontoon included during peak season (June 14th - September 2nd)! Spider Lake is a 278 acre lake located in Vilas County. It has a maximum depth of 43 feet. Fish include Musky, Panfish, Largemouth Bass, Smallmouth Bass, Northern Pike and Walleye. The lake's water is moderately clear. CLICK HERE for more information!